I would love to see you do one with the 1945 AA mods. 1. This photo shows Mark 12 radar on the Mark 37 directors - looks like the aft director on this drawing was left with a Mark 4 (probably just an updating error when creating this one off one of the older base drawings). Interestingly no Mark 22 heightfinders have yet been fitted. 2. The same photo linked above shows some sort of ground plane for the YE homing beacon right below it (I'm not sure what this antenna is) - worth researching. It's the set of 6 antennas extending horizontally from the mast below the YE. 3. The radar antennas in the plan view should be colored with the corresponding camo color to match the ship below them - right now they kind of pop out (since they're normal grey) and it looks a little strange. 4. I would consider adding a curved shade color at the bow to represent the overhang there. Otherwise it looks tremendous as usual. Awesome stuff! Excellent drawing! Very well detailed and nicely executed! These are awesome. I'd be really interested in seeing the SCB conversions, particularly the SCB-125s. Versions of Oriskany would be nice. Thanks to all for your comments and advice. It's much appreciated. 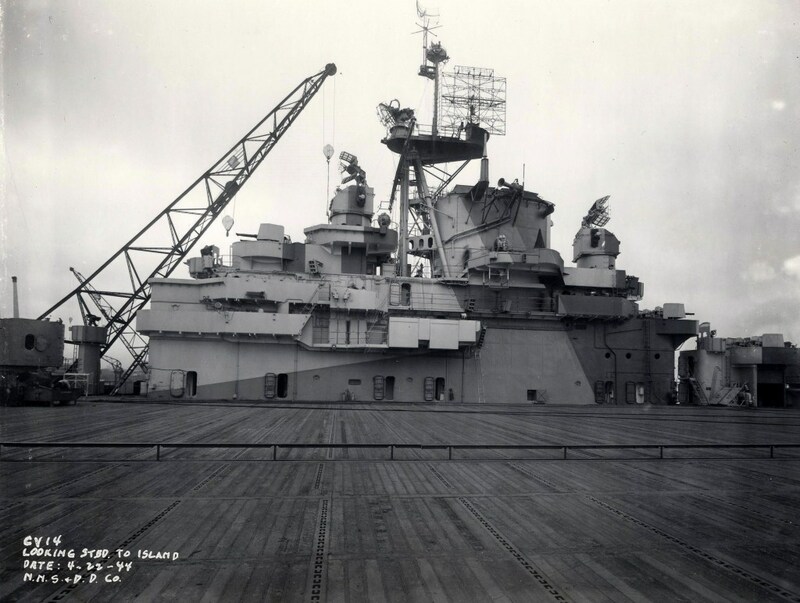 Here's YORKTOWN as commissioned in April 1943. She was launched with 4 x 20mm gun tubs under the stern flight deck ramp but at some point before commissioning they were moved to port and stb aft due to the experience of ESSEX and LEXINGTON which reported heavy vibration at high speed. Her shakedown cruise was off Trinidad for 4 weeks in May and June of that year. During this time her white deck markings were painted black. After the shakedown, she went into Norfolk yard to upgrade the AA fit. 2 more 40mm were added stb aft and more 20mm guns were added. She transited Panama on 12 July 1943 and arrived at Pearl on 24th July. There she spent a month working up with ESSEX and LEXINGTON. Here's YORKTOWN in November 1943 during the assault on the Gilbert Islands. She has just one black deck stripe with red danger markings. At some point black numerals were added to fwd and aft flight deck although I'm not sure if that was an experiment in summer of 43 or early 1944. It's interesting to note that the fwd numerals were inverted. Her SC-2 has been raised on a lattice mast and the SG set on the main mast has been moved to a pole mast on the port side of the funnel. In May 1944, YORKTOWN received her dazzel camouflage MS 33/10a and after the Battle of the Phillipine Sea, she headed for Puget Sound for a refit. Here we see Yorktown in November 1944 during the Leyte campaign. 3 x 40mm have been added on sponsons to the stb side below the island and the two 40mm stb moved outboard onto sponsons. Another sponson was added to the fantail and an extra 40mm fitted to the aft deck. A further 4 x 40mm were added on the port side; 2 at flight deck level aft and two on the catapult sponson on the main deck. The SK set was moved onto a platform on the port side of the funnel and an SM hight finder placed a top the fore mast. This refit was to be a template for all subsequent ESSEX class refits untill the end of the war. A consequence of this massive increase of weight was serious instability issues. The extra AA guns required extra crew and ammunition. With a maximum design displacement of 33,000 tons, the ESSEX class in 1945 were pushing 35,000 tons. Overcrowding below decks was another serious concern with enough bunks for 2,400 men and 300 officers. By 1945 the berthing requirement was pushing 3,400 offcers and men. Despite the tremendous punishment these ships were able to absorb from bomb hits and kamakazes, a torpedo strike would have proved a very different matter. YORKTOWN remained in this scheme until June 1945 at which time she reverted to her MS 21 guise until the end of the war. This thread is always a joy o see. This gets better and better!! !